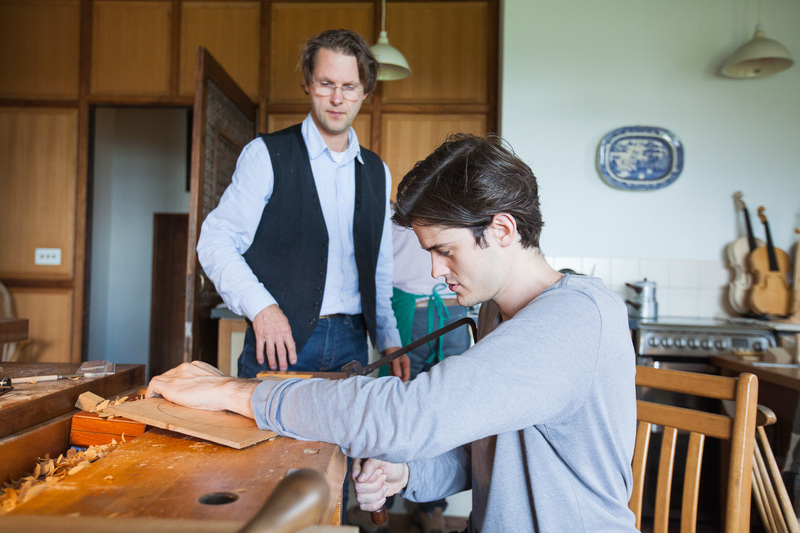 Join us to learn about the art of violin-making, as a new instrument is crafted by luthiers Stefan-Peter Greiner and Mark Jennings, and the world-class musicians of IMS Prussia Cove. 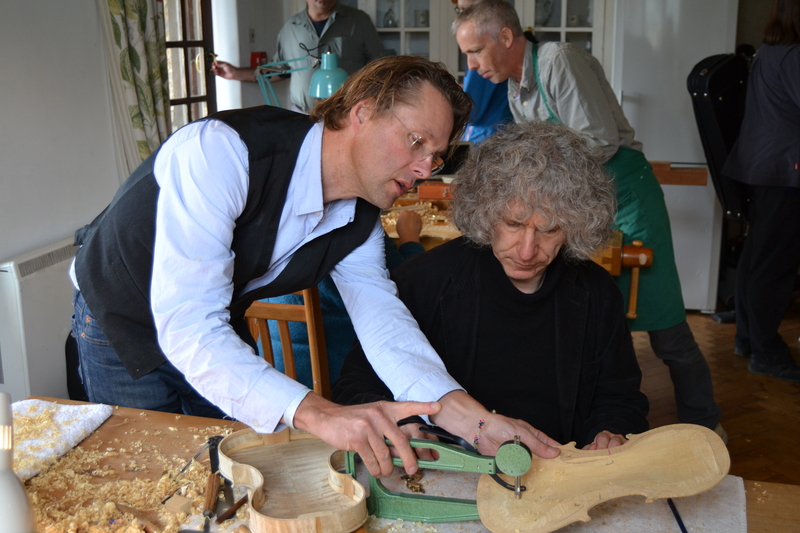 The idea for this exciting new project was formed in September 2016 when acclaimed luthier Stefan-Peter was invited by the Artistic Director Steven Isserlis to attend the Open Chamber Music seminar. 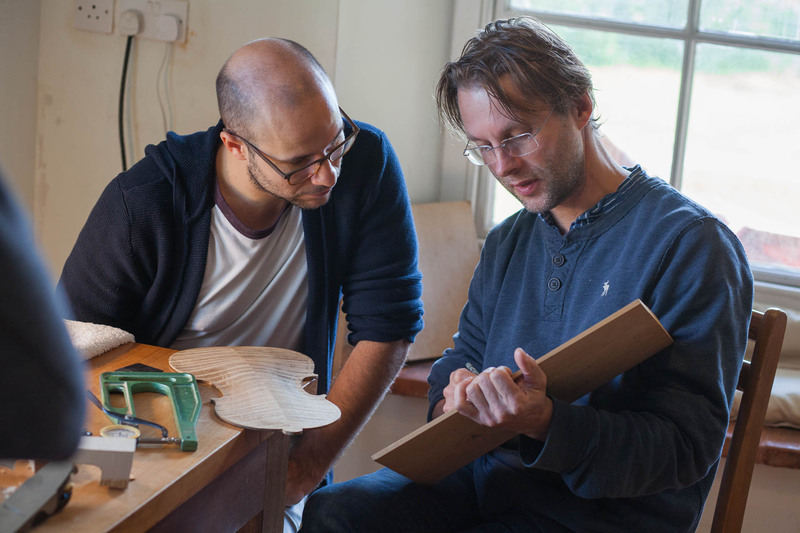 During the seminar, he met our long-term resident luthier Mark and the two instrument-makers decided to collaborate in the making of a new instrument, created especially for IMS Prussia Cove. 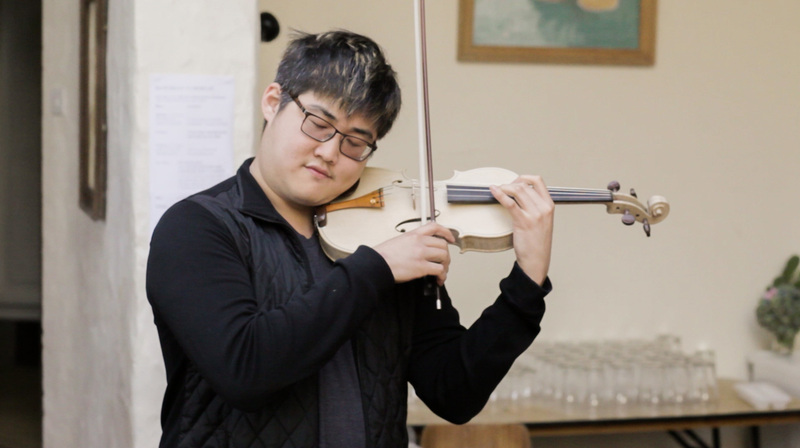 In a truly collective effort, the violin was made during Open Chamber Music 2017 – and came to life with the help of musicians who had travelled to a remote part of Cornwall from across the world to attend the seminar. The project helped the musicians to learn about their instruments from the inside out, while providing an educational blog for followers across the world. Watch with us as a violin is made, step-by-step, inspired by the unique environment of IMS Prussia Cove. The completed instrument will very generously be donated to the organisation by the makers, for which we are extremely grateful. The first groups of musicians arrived at IMS Prussia Cove four days ago, and the seminar is now truly underway as the house is filled with the sounds of busy rehearsals and after-dinner sight-reading sessions. Peter and Mark joined us yesterday, and have been setting up their workshop area – much to the delight and interest of our musicians. 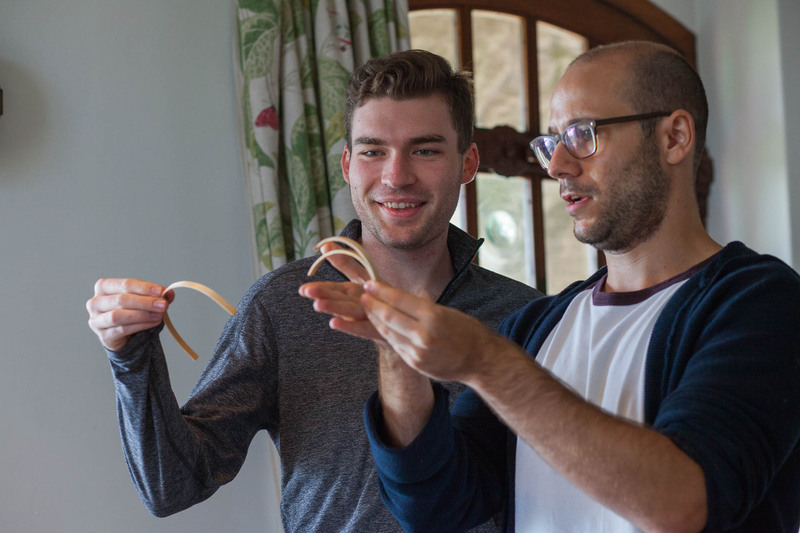 Our, now resident, violin-makers have been talking through the steps of the process, and already the collaborative nature of the project has been really interesting as Peter and Mark discuss their differing approaches to the technique of violin making. 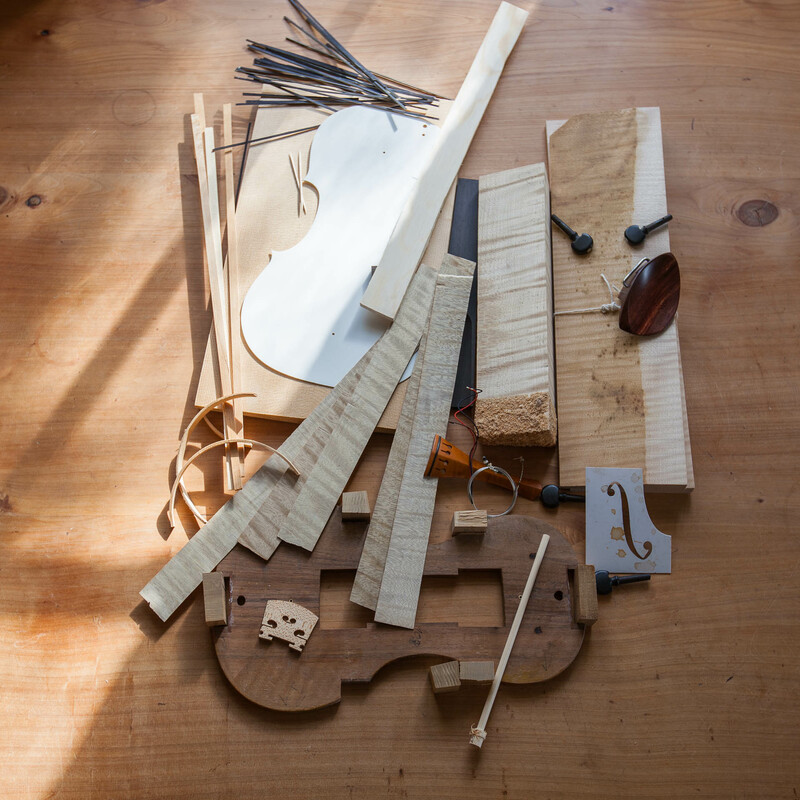 The wood for the back, scroll and ribs of the violin all come from the same maple tree. The use of maple wood is a long tradition in lutherie, favoured above fruit tree wood which in theory could provide a suitable alternative. 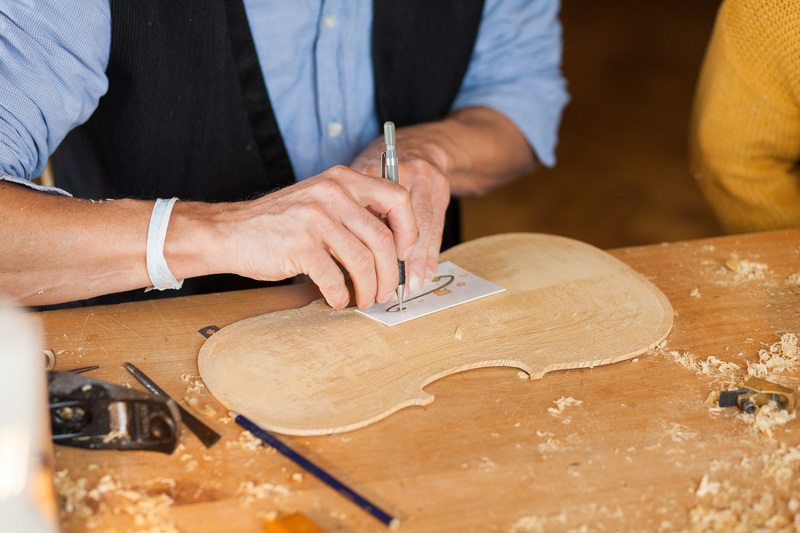 The top of the violin is made of spruce, a vital part of every string instrument including guitars and harps. A piano’s soundboard is also made almost exclusively from spruce. The wood for this violin was bought by Peter in Mittenwald, Germany, around 20 years ago. The choice of wood is a fascinating process, and Peter is unusual in not considering the wood to be of much significance to the sound of the instrument. Instead, he pays close attention to the structure of the wood and how the tree is cut, as well as the visual beauty of the wood chosen. Everybody is enjoying dropping in to the buzzing workshop between their rehearsals to help out. For the back of the violin there are two options: a one-piece back or a two-piece back, depending on the diameter of the tree that is used. 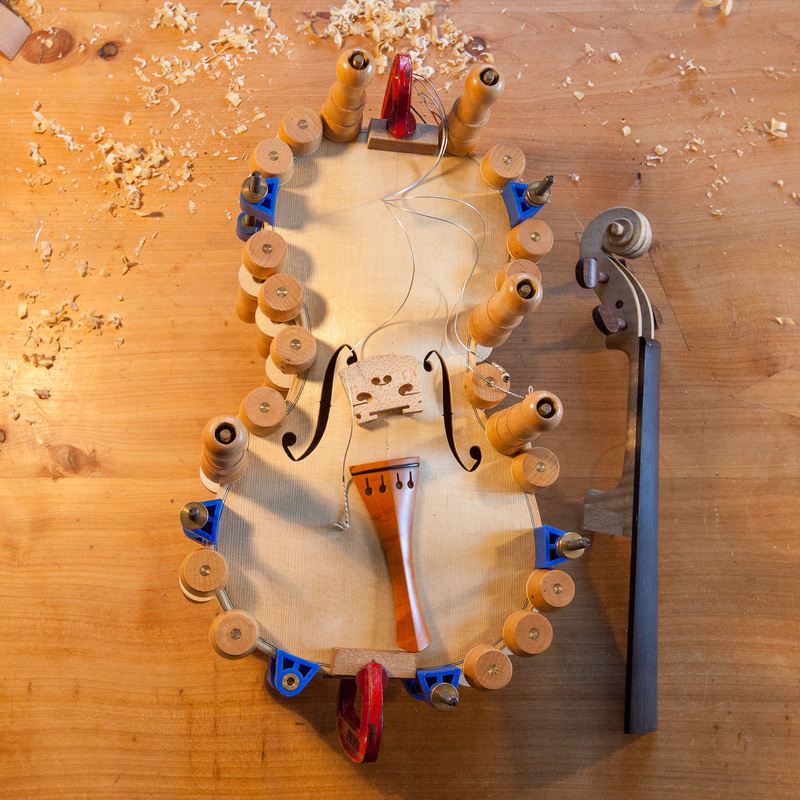 The biggest parts of the violin (the back and the top) are always carved, never bent, which is very time consuming work. The outside of the back is done first – roughly with a chisel, then more precisely with a plane, and finally evened with scrapers (see the photo of the tools below). The inside of the back is arched, which is very important for the stability of the instrument. For acoustic reasons, and also to support the construction (especially the soundpost), the back is 2-5 mm thick. The violin project has proved equally exciting for adults and children, and we’ve enjoyed having some little helpers here with us. 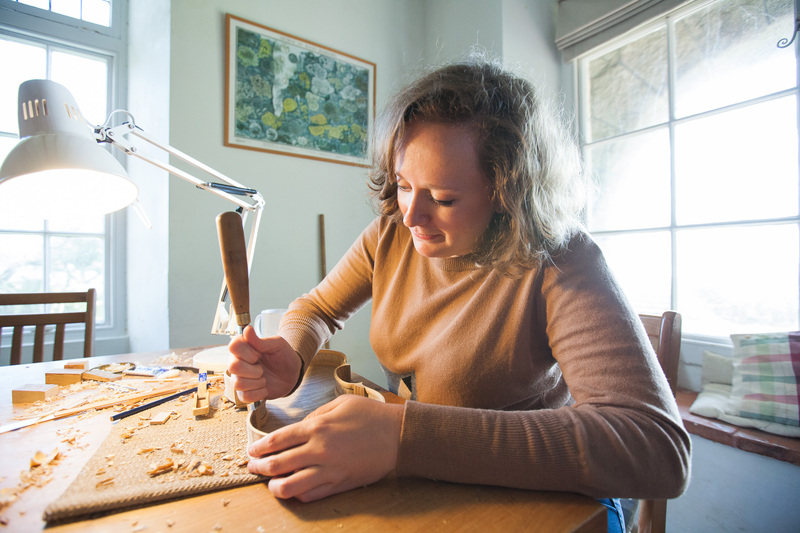 We also started thinking about how one might grow up to become a luthier and asked our resident luthiers about how their careers developed in this niche and exacting profession. The sides of the violin are called the ribs, which are the only part of the violin which is bent. 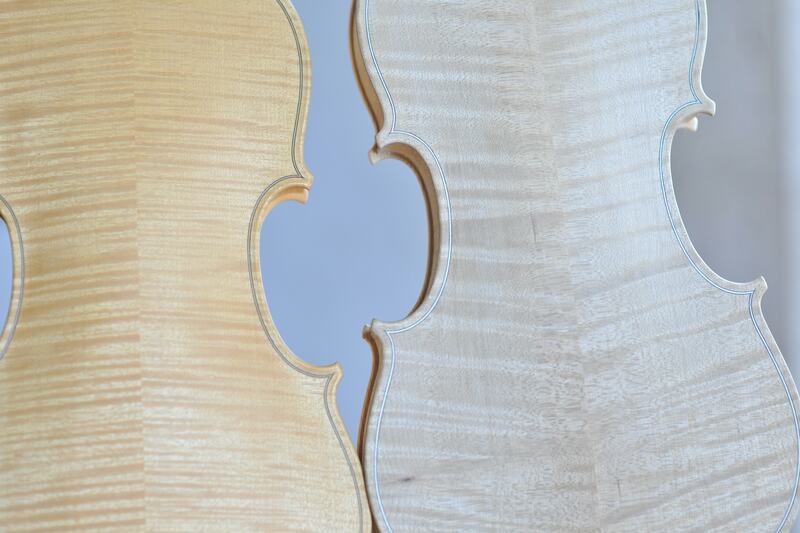 The wood of the ribs should match the wood of the back of the violin, ideally even from the same log. The ribs are steamed to their form on a hot iron which is around 250 degrees. It is possible that the ribs could break while doing the steaming so a luthier would always have spare material. After the bending, the ribs are glued on a mould which is supported with blocks. Our violin is taking shape. Of course the body of the violin is one of the most important components contributing to make the sound of the instrument. How can we make a violin sound good? The construction can help us predict if it will be a dark or a not-so-dark sounding instrument and this is mainly influenced by the wood used, by the arching and by the thickness of the plate. But that doesn’t mean that we will know the quality of the instrument since the quality itself depends on the division of the overtones: we can’t influence the division of the overtones in the construction of the instrument but only later, during adjustments. 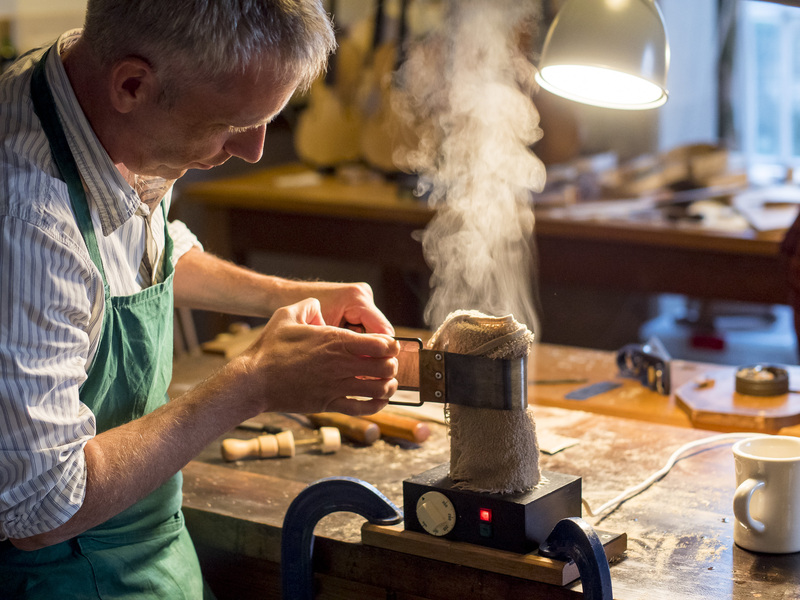 There are several things that make every luthier’s instrument identifiable – the shape of the violin, the purfling and the ff-holes are three of them. The purfling is the beautiful-looking inlay running around the edges of the body. It’s primary function is to protect the plates, preventing the spread of moisture and helping to stop the wood from cracking. Our violin has traditional purfling made of three thin layers of wood, in this case pear, stained black, white poplar, and pear again. The ff-holes are the two openings cut into the front of the violin and they have three acoustical purposes: 1) to give the body the so-called Helmholz resonance 2) to allow more freedom to the part of the plate where the bridge is placed 3) the ff-hole wings act as resonators for higher frequencies. The body of the violin is being glued together and now needs to dry. Hannah Shaw (viola) : …..I think the most interesting thing to me has been seeing how the creative processes of making an instrument and those of playing it are so similar—it’s the same sort of balance of one’s own personality, technical skill, creativity, and expression within the parameters of tradition…. The bass bar, made of spruce, is the bracing glued to the underside of the top plate to prevent the arching from collapsing. It runs underneath the foot of the bridge on the bass side and helps take the pressure that the strings place on the plate through the bridge. When this is glued and shaped, we can go ahead and fix the top plate to the ribs. In the video below you can see how Peter glues the neck to the body. Now only the final parts need to be assembled and it will be ready to play. The violin is finally ready to be played (we had to fit the strings the night before so they could settle). This is how it looks now, unvarnished, of course. This morning many musicians came to the workshop to try it out and the reactions were very positive, but special thanks to Brian Hong and Sarina Zickgraf for this lovely performance of Massenet’s Meditation from Thais at our house concert. 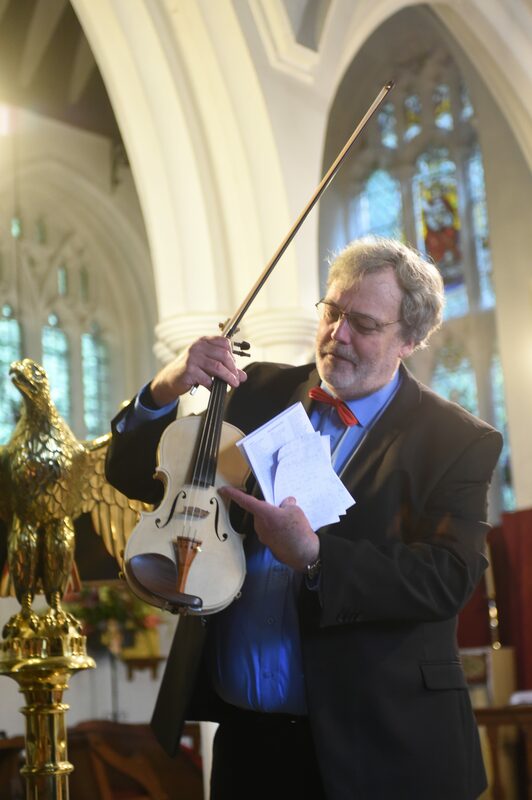 “I’m astounded how beautiful and rich-sounding this violin is, just a few hours after being strung for the very first time…..it was so easy to play, just a few minutes of practise and I felt completely at home with it….I felt I could ask it anything tonally, and it would give it to me straight away, so responsive…people listening to the performance were really enthusiastic too, of the qualities evident in the sound….it’s also beautifully made and lovely to hold, even as yet unvarnished! On behalf of all of us at IMS and all the musicians at this year’s seminar, we would like to thank Peter and Mark for an amazing two weeks! We look forward to sharing our future plans for the new instrument in the coming months, on the IMS website.